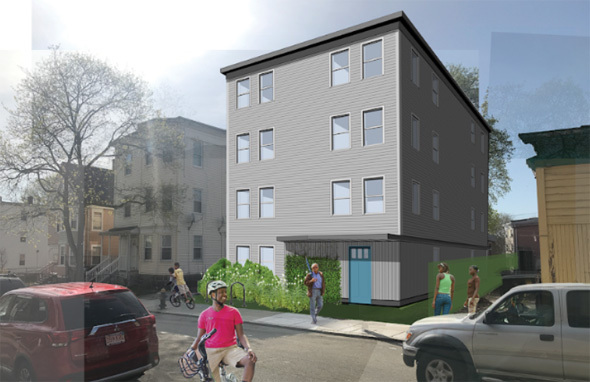 Developer Peter Heaney today filed detailed plans with the BPDA fo 72 apartments in two four-story buildings on either side of Heron Street, a small street at one end of West Roxbury's bird-street neighborhood behind the Speedy Market on Washington Street and single-family homes along Grouse Street. Read more. 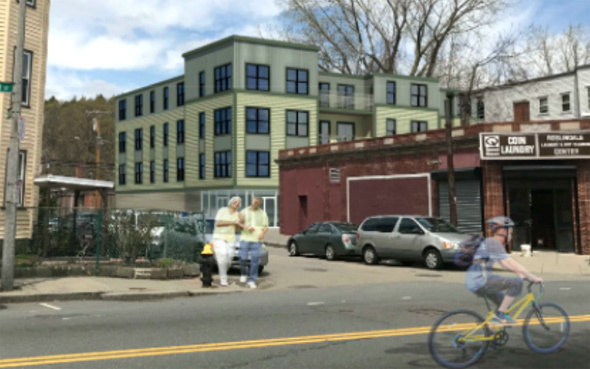 The owners of a Fields Corner cafe have filed plans with the BPDA for a building with 14 studio apartments they say would rent for between $650 and $850 a month - heat and hot water included. Read more. 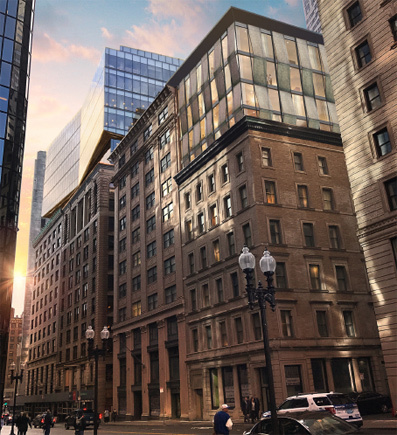 A developer has told the BPDA it will soon file detailed plans to replace the garage at 125 Lincoln St. in the Leather District with a 24-story, 625,000-square-foot office building. Read more. 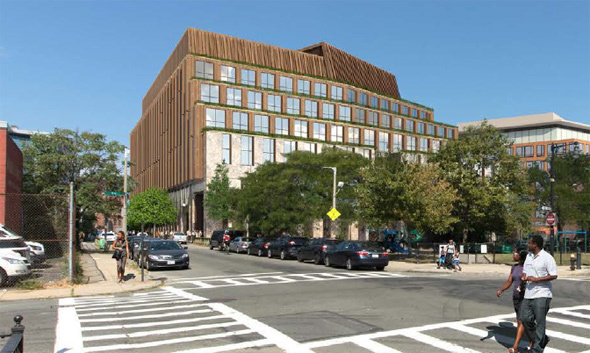 Two developers have told the BPDA they will soon file plans for a six-story "co-living" building where most of the units have four bedrooms - and at least two bathrooms. Read more. 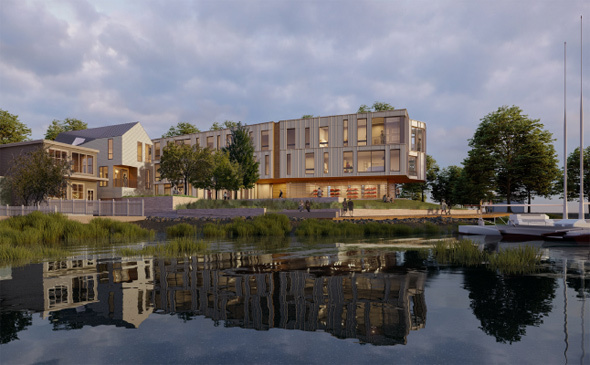 Architect's rendering. T stop on the right. 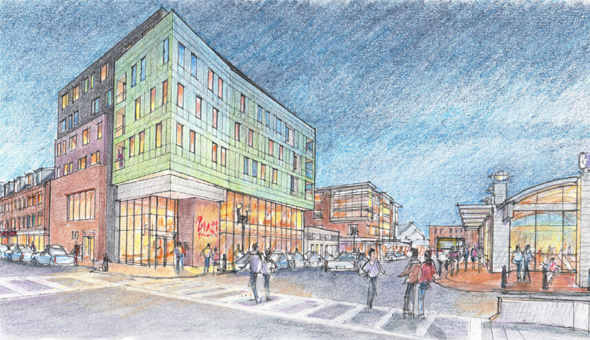 MG2, which has a number of East Boston projects under development, is proposing a six-story, 25-unit residential building on what is now a parking lot at Maverick Square and Sumner Street, across from the Blue Line station and bus stop. Read more. 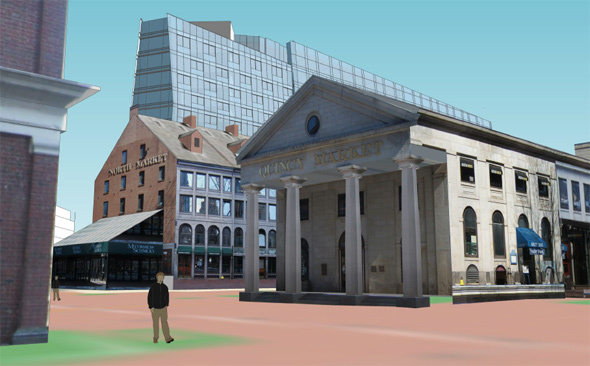 Architect's rendering of what visitors to Faneuil Hall could one day see. 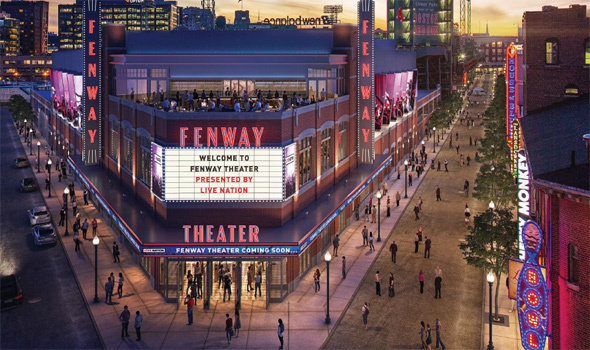 In a strongly worded letter, the Boston Preservation Alliance last week urged the BPDA to kill a developer's plans to rebuild the Hard Rock Cafe garage next to Faneuil Hall Marketplace into what the alliance says would be a monument to god-awfulness. Read more. 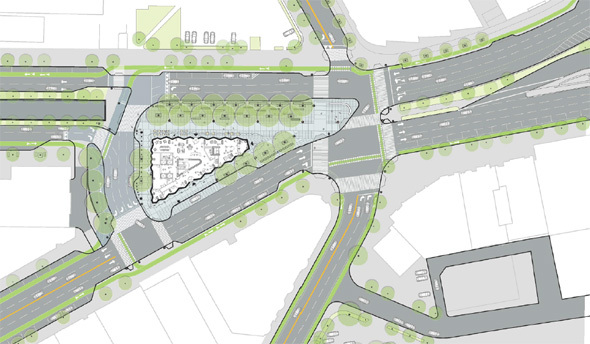 Where the new buildings would go. 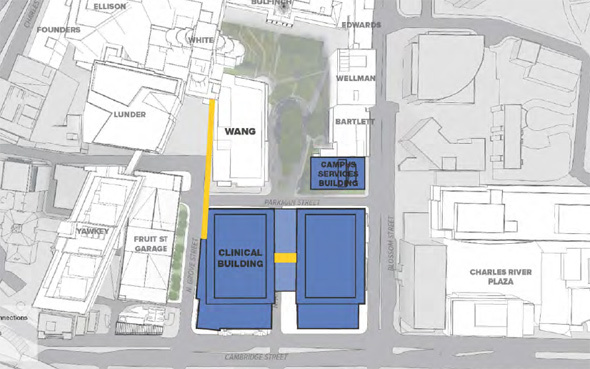 Massachusetts General Hospital this week filed its plans for a $1-billion project that would not only provide "21st century care in a 21st century environment" but create "a place of refuge" where hospital staffers and patients could shelter for up to four days in the face of the worst nature - or man - could throw at Boston. Read more. 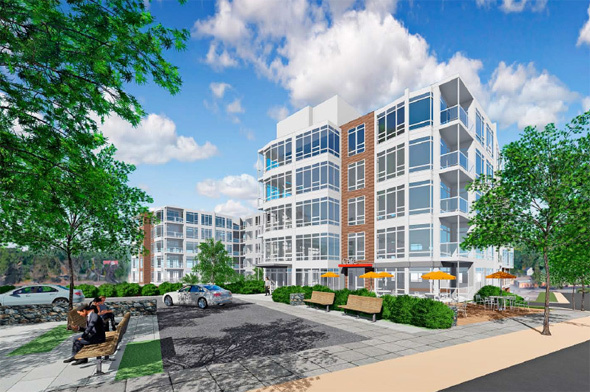 Developer Ad Meliora last week filed plans with the BPDA for a two-building, 305-unit development off Hyde Park Avenue at the Milton Street Bridge. Read more. 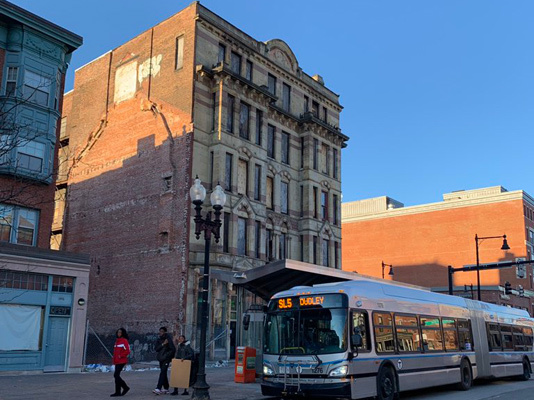 A developer that bought into Related Beal's Congress Square project at Congress Street and Quaker Lane yesterday filed plans with the BPDA to change a proposed 35-unit condo building into a 116-room hotel. Read more. 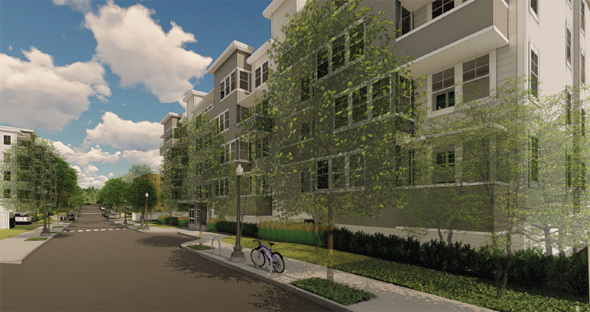 CommonWealth takes note of some recent proposals for new residential complexes in the city that will have little or no parking spots for tenants (like this one next to the Ashmont Red Line station), and says the BPDA is taking steps to ensure the residents actually use public transit and not clog up neighboring streets with their cars - such as creating a registry of the buildings so that the city can bar their residents from getting residential parking permits. Read more. 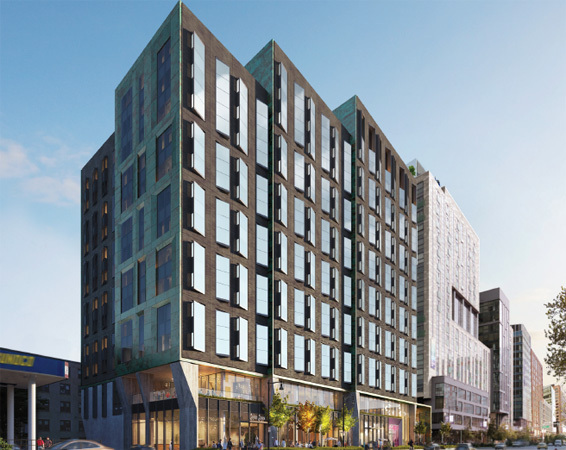 Two developers want to build a six-story life-sciences building on the West 3rd Street parcel now occupied by the Coppersmith restaurant, the one with the food truck inside. Read more. 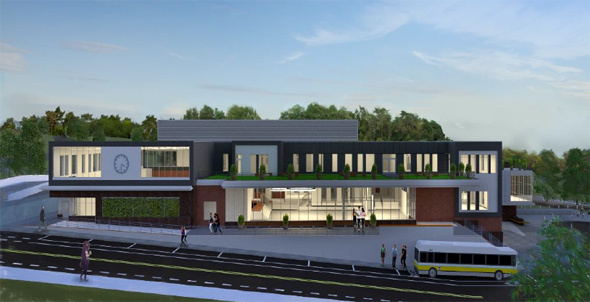 Uncommon Schools today filed formal plans with the BPDA to build a high school on Belgrade Avenue at West Roxbury Parkway that is smaller both physically and in terms of the number of students and teachers than in initial proposals. Read more.